The view from the Ellora caves. Photo by Keren Su/Getty. All other photos supplied by the author. We were a group of secular Buddhists visiting the cave temples of India. What would we learn on the journey? is a buddhist teacher and former buddhist nun. Her latest book is The Spirit of the Buddha (2010). She lives in France. A rooster crowed at 4am in downtown Mumbai. Where could it be coming from in this network of tightly woven buildings and streets and shops and people and cars? 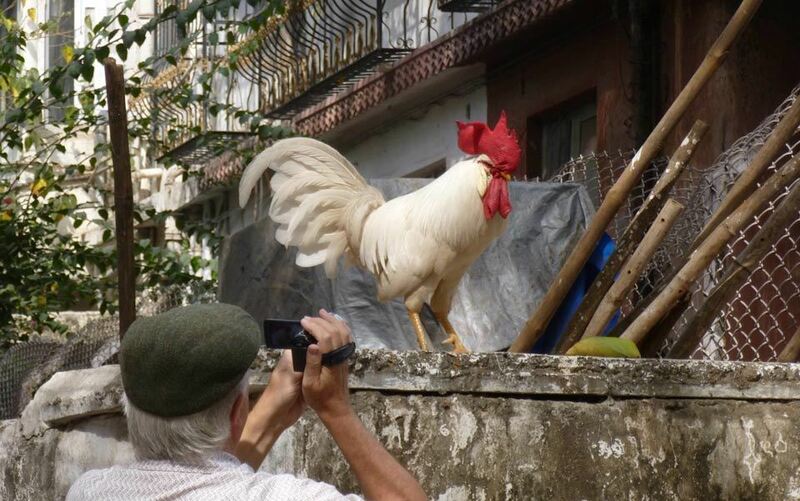 In the morning we saw the proud specimen patrolling in front of our hotel. This was the start of our journey where ancient and modern, nature and traffic, would meet again and again. We were a group of 30 questioning, secular practitioners on a different kind of Buddhist pilgrimage, to a series of ancient rock-cut temples and other early Buddhist sites. We wished to re-inspirit these places, which were now mainly archaeological sites: we would walk in the footsteps of those who had lived and practised the way of the Buddha from the first century BC to the 10th century AD. We planned to meditate, listen to talks, and discuss the Buddha’s teaching each day. Towards the end, we would visit two famous caves, Ajanta and Ellora, but all the other cave temples we planned to see were relatively unknown and rarely visited by Western Buddhists. We began in Maharashtra, in western India: the home both of ancient Buddhist caves and also a very modern, distinctive form of Buddhism. As I tried to find a path among the throngs of people in the streets of Mumbai, I was struck by all things ‘ambedkarite’ — posters, T-shirts, scarves, amulets — and couldn’t resist buying a plastic kaleidoscopic portrait of Ambedkar himself. The Indian jurist and political reformer Dr B R Ambedkar was born in 1891 to an ‘untouchable’ or Dalit family who served the British army. He was the first Dalit to graduate from university and, as the first law minister of independent India, one of the main architects of the Indian constitution. Two months before he died in 1956, he converted to Buddhism because he believed it was the way for Dalits to escape the Hindu caste system. He urged mass conversions and himself held a conversion of 400,000 people in the state capital of Nagpur. Throughout our journey, we would meet families of Buddhist converts, former ‘untouchables’, and the first thing they would mention was Ambedkar, their hero, who helped them improve their condition and develop their confidence. The spirit of early Buddhism was alive here in more ways than one. After the Buddha’s death c.404–484 BC, Buddhism was mainly situated in northern India. By 232 BC and the death of King Ashoka — one of the religion’s foremost supporters — Buddhism had spread all over India. Over the centuries, however, Buddhism declined because of its strong emphasis on monasticism on the one hand and the strengthening of Hinduism and the caste system on the other. Repeated invasion by central Asian Muslim nomads from the 11th century onwards was the final straw. Buddhism more or less disappeared in India or was amalgamated with Hinduism. Many wooden and brick monasteries were destroyed but the rock-cut temples of Maharashtra endured, albeit emptied out. Our first visit was to the 109 caves of Kanheri in the deeply forested Sanjay Gandhi National Park less than an hour from Mumbai. The first thing we were told was to keep our packed lunches safe from marauding monkeys. We even had to be protected from them by a guard as we meditated in a 2,000-year-old hall. Kanheri became dear to my heart, a haven of caves with few icons, its simplicity deeply evocative of early monastic life. There were many small carved stone huts: monastic cells with one or two stone beds and light coming from small windows punched into the walls. Outside each cell was a small cistern for water, which was fed by an intricate system of underground run-off. An elegant stone bench to the side completed the set-up — for the view, as a place to rest in the heat, for interviews, or for all three: who knows? It was easy to imagine myself as one of the monks or nuns meditating, chanting or studying, or as a layperson visiting them for inspiration and encouragement. Here one did not feel a convert to a strange exotic religion but a practitioner of a path, a culture of awakening. Kanheri was one of the oldest sites we would visit. As we went on to many different types of caves — large halls, small dwellings, grand chapels — I was struck by the difference in style between the early and the late carvings. The simple geometrical shapes of the first-century BC stupas evoked modern sculptures, while the later elaborate statues of the Buddha and different Bodhisattvas was a reminder that we were in prolific, abundant India, where Buddhism and Hinduism had overlapped for hundreds of years and influenced one another. Many of these later temples were in fact built and decorated under the patronage of local Hindu rulers. Some ancient Buddhist cave temples had been adopted by villagers for their Hindu worship. 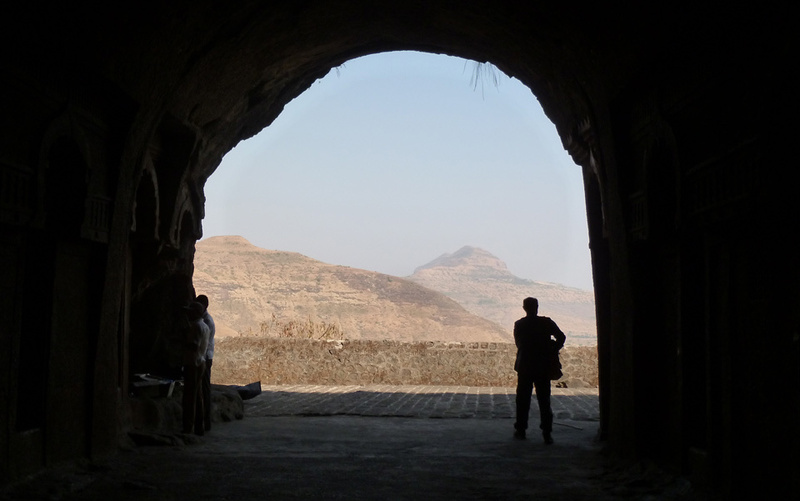 The Karla cave, two hours from Mumbai, was now associated with the goddess Ekveera, who is worshipped by fishermen. While climbing up from the Indrayani valley, one passes a gauntlet of shops selling flower garlands, coconuts and other such offerings to her. The goddess herself resides in her own small temple outside the main cave of the complex, which is fortunately still intact. The Karla caves were carved between 60 BC and the fourth century AD. They were created as the offerings of princes, merchants, monks, nuns, and lay devotees. Some of the pillars contained the ashes of the patrons, held in a special hole carved in the middle. 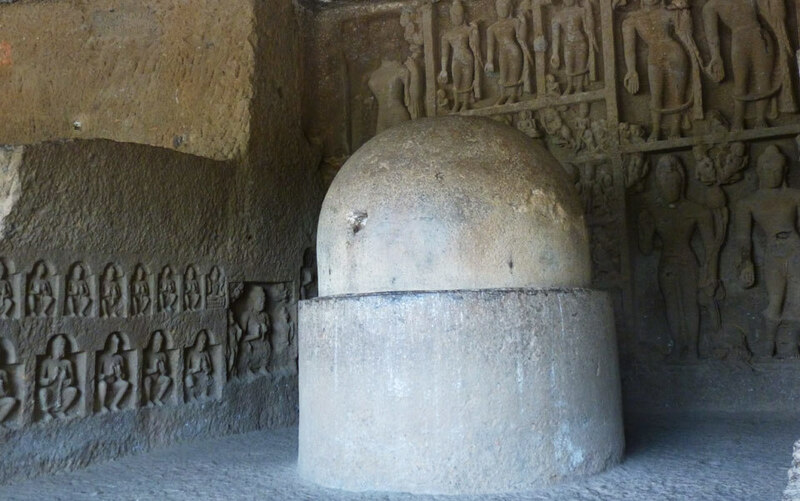 The main cave was the chaitya — a prayer hall containing the most intriguing stupa we would see on this pilgrimage. The hall itself was the biggest rock chaitya in India — 45 metres long, 14 metres wide, and 14 metres high, all carved out of the hillside. It seemed to us that the hall had two main functions, as a gathering place for chanting together but also as a place of circumambulation. All of us spent time walking meditatively in silence either around the stupa itself or behind the pillars. Stupas originated as funerary mounds, and the earliest Buddhist stupas were built to contain relics of the Buddha himself. But over time they were elaborated far beyond those simple forms, into the wats of south-east Asia, the pagodas of Japan and China, and the chortens of Tibet: beautiful and complex architectural forms with many layers of symbolic meaning. In Karla we were brought back to the beginnings of the tradition: the stupa here was formed of two drums surmounted by a dome, on top of which was a cube, on top of which was a seven-stepped inverted pyramid which was pierced by a wooden shaft from above and covered by a wooden canopy. Apart from the wooden pole and top, it had all been carved out of the rock where it stood. These early stupas were completely unadorned, pre-iconic. To see such spare beauty and exquisite geometric forms, representing the Buddha’s practice and attainment, was incredibly moving. We were reminded that ‘less is more’. One of our promised treats was the Bedsa Caves, which were built between the first century BC and the second century AD. We climbed a hundred steps in silence to be greeted by a jewel of a place with an amazing panorama of the surrounding countryside and comfortable living quarters where we could sit and spread out. We had come for a day of silence and practice. The theme of our meditation was listening, listening mindfully without commenting, neither grasping nor rejecting, observing the arising and passing away of various sounds. This creative listening meditation was our mainstay as we travelled and communicated with each other over two weeks. We did not have much time to spend in each site as we had to travel back and forth. But that hour of daily practice and reflections on dharma (or cosmic law) had a profound effect on all of us. Being in situ, connecting to previous practitioners within the simplicity and beauty of these sites, had an organic impact on us, and also on the careful, attentive way in which we related to each other. Retreats are generally held in silence with a lot of sitting down in meditation: here we were on the move constantly, exchanging, packing, exploring: a travelling retreat. So sitting in meditation for half an hour in the caves was deeply grounding and restorative. I became undistracted, and peace came very quickly: I felt grounded and expansive, even amid the tumult and bustle of India. As we travelled, one of our challenges in such a crowded country was to find a secluded place to pee mindfully. While we drove through desert terrain, our mantra became ‘pee while you can’, and our coolest open-air lavatory was a banana plantation. The stupa hall in Bedsa was so small and exquisite that we could not resist doing some chanting. But, being secular Buddhists, not many of us knew any chants or, if we did, not the same ones, so we aborted this tentative sign of devotion. But the space suddenly echoed and resonated with the deep two-toned chanting of one of our members and we just stood in the resonating silence. The stupa itself was a mystery, reminiscent of Karla, but what was that at the top? Was it a lotus flower or a bodhi tree? In any case, it was an enigma we did not solve. Not all of the caves had a radical simplicity to them: our next stop was the Pandulena site. Built between the second century BC and the seventh century AD, it is a cornucopia of 24 caves, overlooking the industrial city of Nashik (population: 1.5 million), which was a major trading centre in ancient times. The cave complex had not only been a place of worship, but a lodging house for traders, and a sacred place for worshippers from other traditions such as the Jains. Kings, princes and wealthy merchants vied with each other for posterity, leaving a wealth of carvings and caves as their legacy. There was a profusion of statues, and we encountered our first lying Buddha, representing his death or nirvana. There was lovers’ graffiti on some carvings — the modern world catching up – and smiling cats in one small Jain chapel. 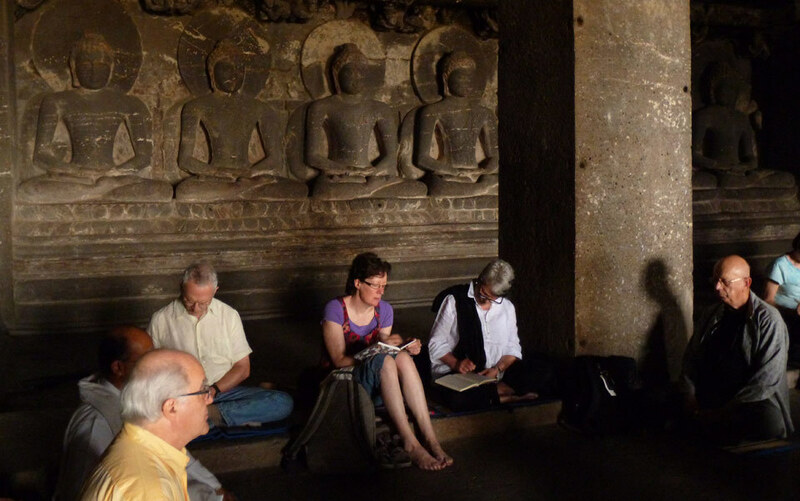 Our next stop was the most splendid of rock-cut temples: the masterpieces of Ellora and Ajanta. We were apprehensive, knowing that the caves would be full of tourists, most of whom would not share our desire for travelling meditation and study. We focussed again on our listening meditation, letting the surrounding sounds pass through us without grasping at them. We found a large cave, somewhat out of the way, where we were surrounded by large Buddhas set among pillars, and I felt a sense of awe to be practising in such a place. One of the astonishing qualities of Ellora is the way in which the artisans and artists used the different lava flows to help with the carving. There were many volcanic eruptions over the millennia, and many different types of lava flow, with varied composition. Fine-grained rock was preferred for sculpting, and builders used the verticality and horizontality of the different strands of lava to make hewing easier, as well as taking advantage of the fact that basalt is softer when first excavated and hardens when exposed to the elements. We were all secular Buddhists, which means that we practise in a way that is relevant to this time and world. We do not see ancient Buddhist ideas and practices as sacred and unquestionable. At the same time, we could be deeply touched by what was sublime in these cave temples — the majesty, the artistry, the dedication. I do not believe in the sacredness of traditional Buddhist lineages, which are created to assert the authenticity of different Buddhist traditions. But here in these temples, be they from the second century BC or the eighth century AD, I felt part of a faith and practice lineage that transcended any specific school of thought or personal allegiance. At Pitalkhora, where we had the prospect of spending a day in quiet meditation, we were touched by the neglect, as much as by the splendour. We knew that this small ensemble of caves was said to be in a fairly bad state of repair but it was also deep in a small valley with a brook, which made it an enticing proposition for a day among nature, water bubbling, greenery and silence. And so we climbed down into the valley but none of the above came to pass — there was a drought. Here was impermanence in action. Moreover, to attract tourists, some official had decided to have the caves rebuilt, so masons were in the process of cutting stones with a power saw. That day the villagers were also using the path running through the caves to go to a religious festival further down the valley. We meditated, studied and walked in silence, trying to welcome the cacophony as much we would have welcomed the solitude and peace we’d hoped to experience. In the midst of the destruction and rebuilding we saw a rare sight, some beautiful paintings. 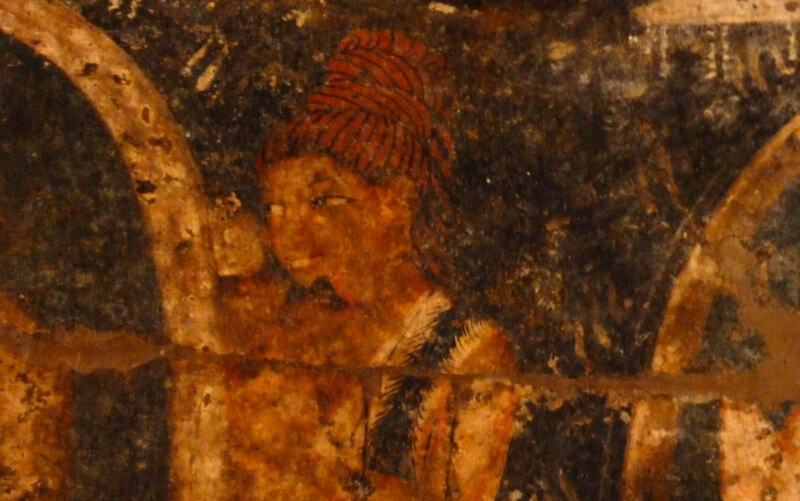 Because the front of the stupa hall had vanished due to the poor quality of the rock, the paintings were exposed to the light, enabling us to admire them and take pictures. There were some intriguing portraits of female assistants with intricate hairdos more like ancient Roman coiffures than the classic Indian styles. Our final goal was to visit the great stupa of Sanchi, a 10- to 13-hour journey from Bhopal, a popular holiday spot now better known for the gas leak disaster at the Union Carbide pesticide plant, which killed thousands of people in December 1984. The magnitude of the disaster was partly due to compromised safety standards at the plant, and officials who had realised what would happen that night and fled the city to save themselves without telling anyone else. We paid our respects at the abandoned plant where children now played cricket, and I found myself wondering about humanity’s strengths and weaknesses. It was hard not to fall in love with Sanchi, especially in the evening light, which makes all the sculptures and carvings appear golden. We meditated under a large tree overlooking the main stupa, built by King Ashoka to enshrine some of the relics of the Buddha. It served as the centrepoint for the construction of a large complex of temples, stupas, halls and monastic institutions, which were built around it between the third century BC and the 12th century AD. The main stupa itself was enlarged and embellished with decorated balustrades, staircases and gateways. It is too complex to describe; it must be experienced. It was lavishly carved and I was astonished by its pristine condition. For someone who loves designs, it offered a cornucopia of leaves, flowers, animals and many other motifs: it would take a week to see all the details. We only had a few hours and it was an enchantment. As remarkable as this, so wonderful would be the sight. To the glittering heavens, they are so accustomed to the skies. Here, in Sanchi, I realised that the essence of a pilgrimage was to experience in one’s flesh and with one’s own immediate senses the traces of the ancients, to be humbled and uplifted to be in close contact with such beauty. To be a pilgrim is to become unaccustomed to the skies, seeing them in a new light, with a newly open heart.